Oh my what a oxymoron! Flamingo pink dragon skin. I made them for myself. 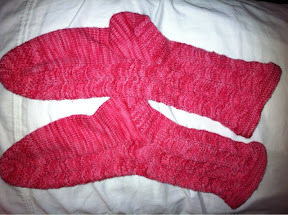 I love the yellow ones I made so much that I've made these bright pink ones so I could return the bumblebee socks to Marco. 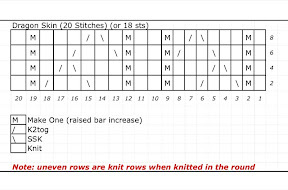 I started from toe with a half linen stitch and then for the pattern I adapted Barbara Walker's Dragon Skin Pattern to this chart and used 18 stitches (total 72 sts) by reducing two stitches between the two "M" to one stitch. The chart is slightly misleading. For 18 sts there should only be 1 st between ANY OF THE "M". That is, the pattern should start with a M not a knit stitch and there should only be one knit stitch between the two M in the middle.